The lastest from my bro! Listen and spread the greatness! So you know my bro raps, well this is him and his 3 yr old daughter Ava laying down a very special Mother's Day track for Angela (his wife/her mom). Check out my bro teasing the world on this classic Nas track! This is just a sample! More to come! www.mevsMJ.com <-- Check out my journey to play hoops with Michael Jordan! It's worth your time! Check out my bro teasing the world on this classic Nas track! This is just a sample. More to come! Spread the wordddd! Check out my bro teasing the world on this classic Nas track! This is just a sample. Much more to come! Spread the woooordddd!! I picked up a jar of these a week ago at Publix and I must say...THEY ROCK! They are nice and crunchy with a great pickle flavor. 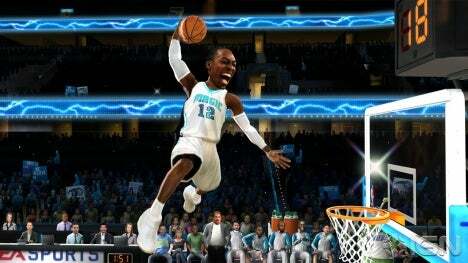 EA Sports announced today that NBA Elite 11, the new basketball sim that spawned from the once-great NBA Live franchise, will come bundled with a one-time download code for a new, high-definition version of NBA Jam for PlayStation 3 and Xbox 360. 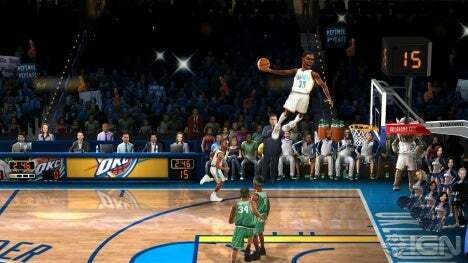 If you've seen any of our coverage of NBA Jam for Wii (winner of our Sports Game of the Show Award at E3), then this announcement should have you mighty excited to see what EA Sports can do with the added horsepower of HD consoles. The bundle of NBA Elite 11 and a download code for NBA Jam will hit store shelves on October 5 for Xbox 360 and PlayStation 3 for $59.99. Wii users concerned about their version being overshadowed should rest easy knowing that the Xbox 360 and PS3 downloads feature a scaled back set of game modes. For the $59.99 price tag of NBA Elite 11, players will be able to enjoy the Classic Campaign (a simple ladder-style tournament that pits you against the rest of the league) and an Exhibition Mode. The HD versions, however, will support online multiplayer over Xbox Live and PlayStation Network, a feature that has yet to be confirmed for Wii users. As fate would have it, I recently took a trip up to Vancouver to get my hands on an early build of NBA Jam and we'll have the first hands-on and direct-feed footage this Friday on IGN. For now, feast your eyes on our pair of screenshots and be sure to note the fantastic facial expressions. Digging this All Natural low cal Flavored water!!! This stuff rocks and doesn't have that diet taste because it's all natural and organic! Something very fun about drinking from a mason jar:). Nullify Anew Vintage Apparel rocks the house! So I recently bought three items for my wife from Nullify Anew Vintage Apparel, all for less than $20 each, and she absolutely loves them! The site offers around 15 different items weekly, all starting at just $14.99. People bid on the items through the week, with the highest bidder getting the item. Standard ebay stuff. The descriptions of the items are very detailed and include tons of pictures. Having received the three items in the mail today, I can confirm that they were in great condition. If you have some spare money, even $5, consider helping InPassing get one step closer to their dream. They are trying to raise $10,000 to fund their next album and they need our help! Only 9 days remain!!!! I personally know these guys and they are truly great people. Everyone reading this has a dream or has dreamed and just wished someone would have helped. This is your chance to make a difference. Give $5 or $10,000...whatever your circumstance allows. Your funds will not be wasted...trust me. "Since the independent release of our EP "Breathing in the Ash" in 08', our band has been through an incredible journey and has survived solely by the amazing love and generosity from our fans, friends, and family. We literally could not be here today if it was not for YOU ALL! Over the past 2 months, my drummer and I have been walking some truly amazing paths that have changed our lives and have been writing some of our best material as a result. The writing process has been coming from some of the most natural and honest places that we have ever reached and we can't wait to include you! We are heading back into the studio in May to work with our best friend and producer James Paul Wisner. Never before have we believed so much in the songs, ourselves, and most importantly, the people you have loved us all along! This next record will be more than just another release, it is a higher calling for us and a movement that we want create alongside with you! So, WITH YOUR HELP, we're going to make this album with you guys and without a record label! Thanks to Kickstarter, we can raise funds to record our own album without a label. We can take all this amazing material we've been building up and record the best record we can possibly make. And the best part? We can do it with the help of you wonderful people... and reward you with cool stuff in return! When you make a pledge for our project, we get closer to our goal of $10,000. If we hit our goal by May 24th, your credit card will be charged, and we'll start making our new record. In return for your pledge, you get all kinds of exclusive gifts listed to the right. However, if we don't hit our goal in the time allotted, no one is charged anything at all, no gifts go out, and we all move forward as if nothing happened. Think of it as a glorified album pre-order, before we make the album! All payments are processed solely through Amazon.com, so your information is safe and protected. We've been so lucky to have such AMAZING and WONDERFUL fans, friends and family. The bottom line is, we want to create some of the most amazing songs we have ever written .... songs that make a positive difference in this world and can touch people's lives. We want to take all the years of hard work, ups and downs, successes and failures, and turn them into the record we've known we can make all along! But we can't do any of this without your help. Please show your support by making a pledge, and together we'll finally make INPASSING's best Album yet! - Robby and the Boys"
Just made some homemade vegan raspberry scones...and they rock! My next runnings shoes? I think so! What $250 bought for my World Vision child Orlando! I am the 2010 League Champion in my fantasy basketball league! MercyMe's new album will drop May 4th. Can't wait! Listen to "Stand" by Bob Eller (my bro) BRAND NEW!!! Anyone pre-ordering the iPad today? With 5 weeks of training Charissa and I put in a time of 2:07 for the 13.1 miles (9:46 avg). I just placed the order for this Black and Decker Energy Monitor for the house. After seeing my power bill jump by 2.5 times the amount of the previous three bills, I thought I'd look into it. Worst case scenario, it's $85 that will be like a toy. Best case, we save a little cash. Anyone else have one or use something similar?